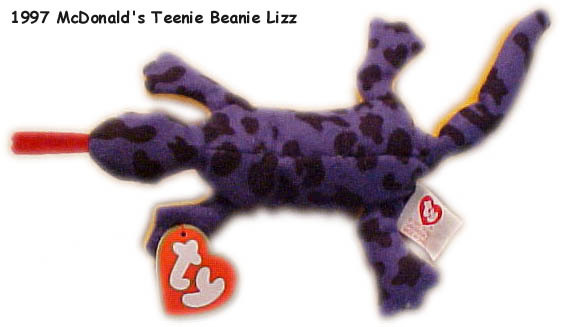 In 1997 Beanie Babies were definitely the hottest toys around. 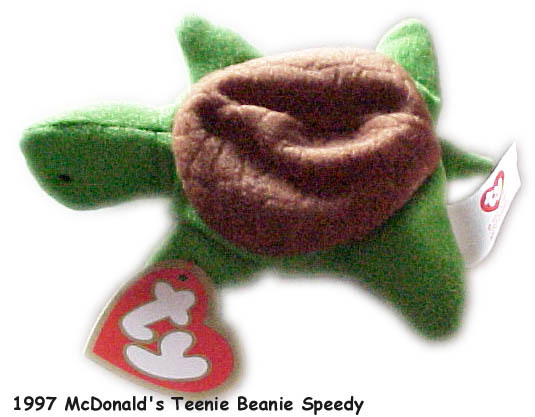 With Beanie Babies popularity and McDonald's proven power to bring children into their restaurant for toys, these two were bound to meet up. 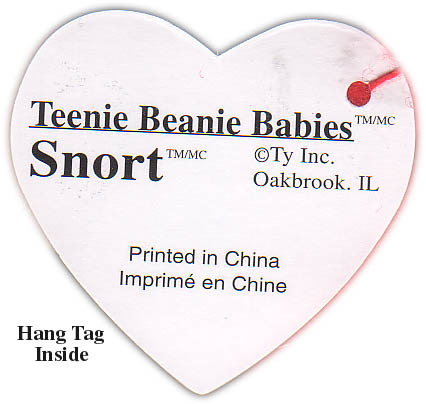 Especially with both being based in the Chicago area! 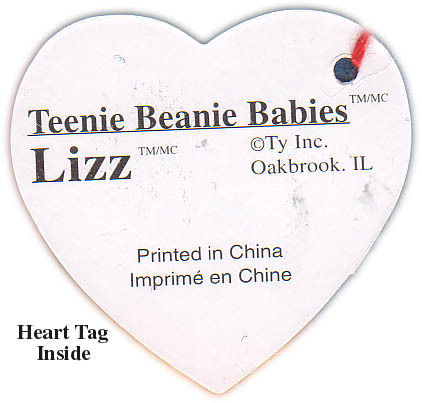 Beginning in April of 1997 McDonald's was going to introduce the first ever "Teenie Beanies," which are miniature versions of Beanie Babies, to be given away with their Happy Meals. 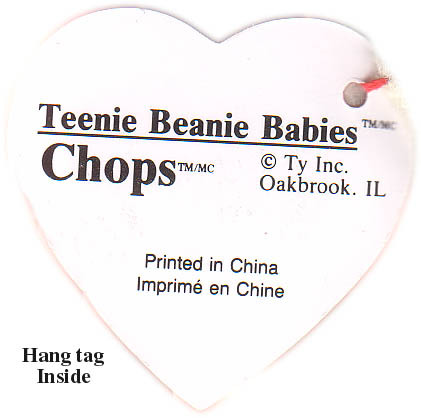 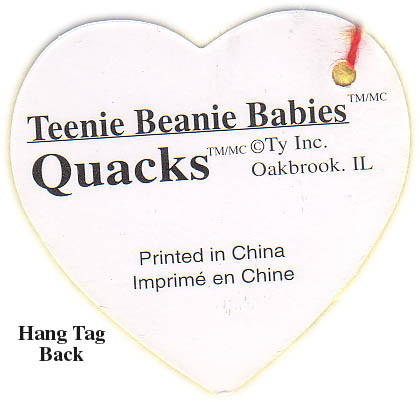 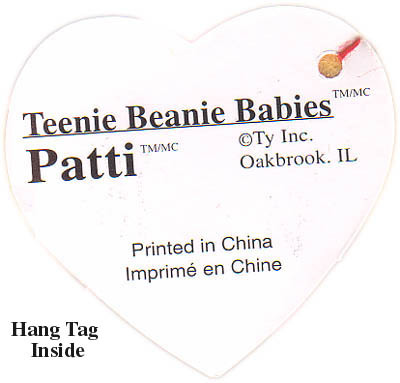 Two Teenie Beanies were to be offered each week until May 15, 1997. 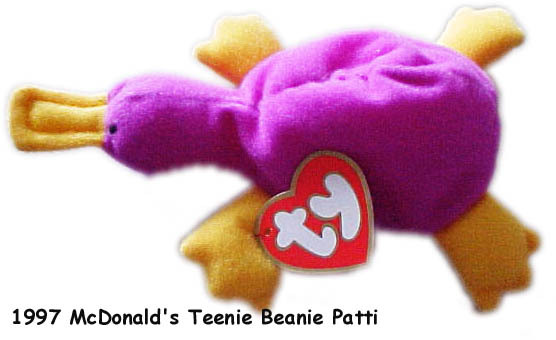 Even before the Teenie Beanies were officially announced to the public McDonald's restaurants all over were getting dozens of phone calls from people asking when they would receive them. 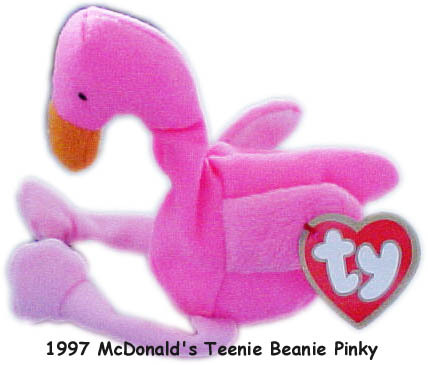 These were going to be the hottest McDonald's toy yet! 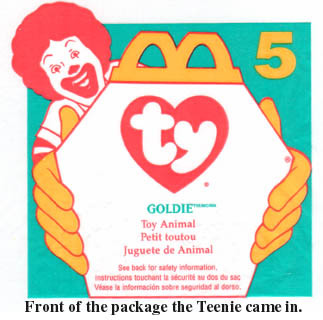 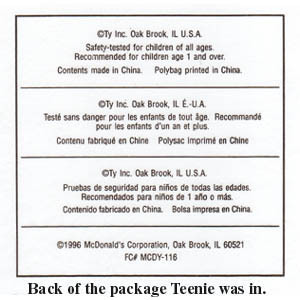 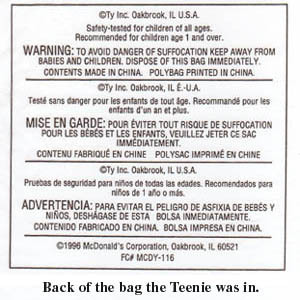 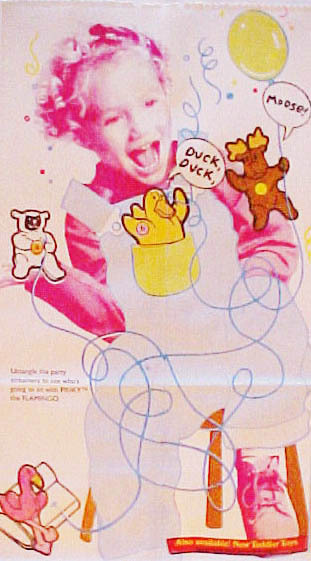 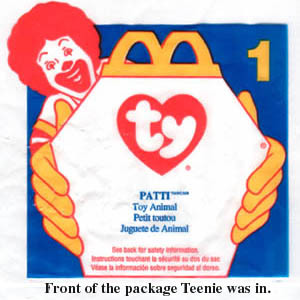 Each Teenie Beanie was packaged into a square plastic bag, the front of the bag had a picture of Ronald McDonald holding a Happy Meal box. 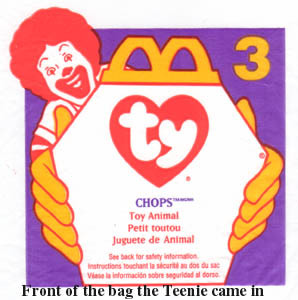 Inside of the Happy Meal box he was holding was the name of the Teenie Beanie in the bag. 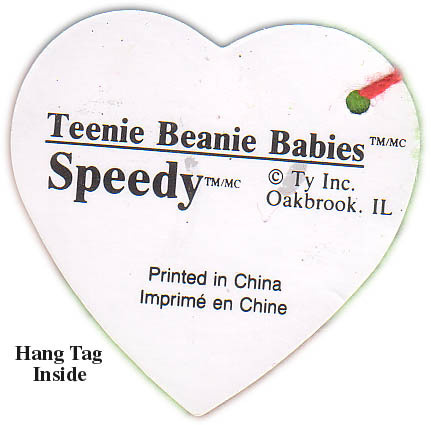 Teenie Beanies were beyond hot! 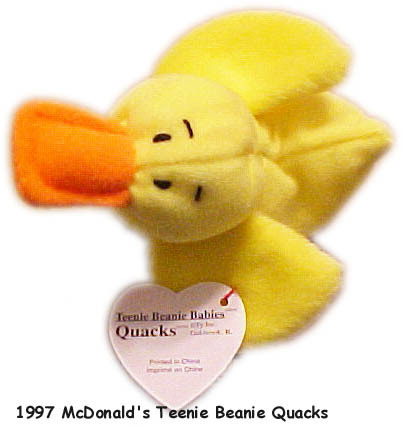 They sold out quicker than expected; restaurants were packed with people from open to close looking for these little stuffed toys. 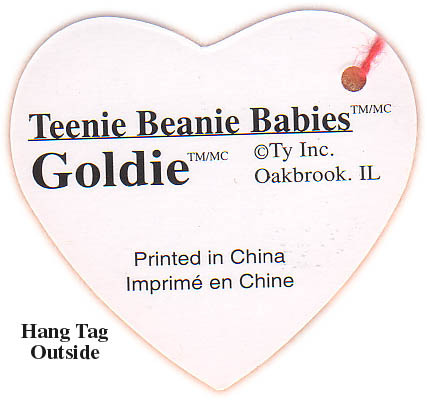 Most styles sold out in the first day by noon! 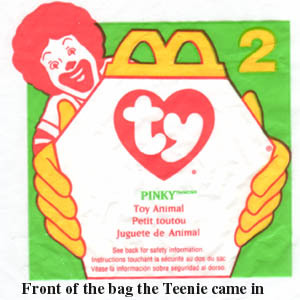 Collectors were buying dozens of Happy Meals a day just to get enough toys to satisfy their kids, grandkids and even neighbors! 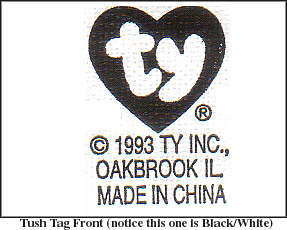 Many turned around and sold them on the secondary market for much more then they paid. The demand was high and the supply was low! 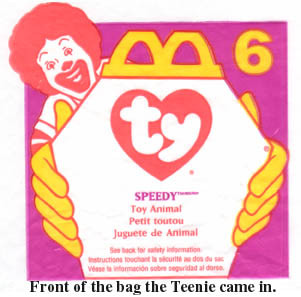 Many people were forced to get their Teenies on the secondary markets where complete sets of the 1997 Teenies were already selling for well over $100. 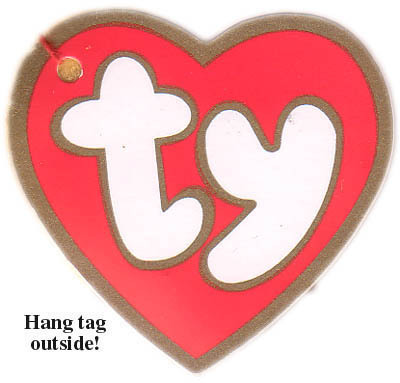 Once again Ty added fuel to the fire and kept his collectors going and interested! 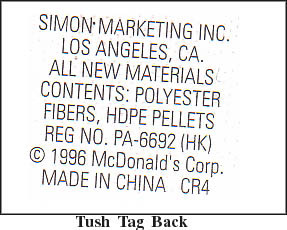 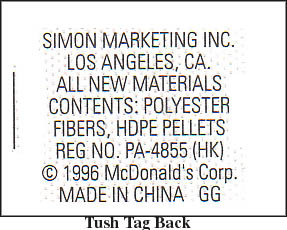 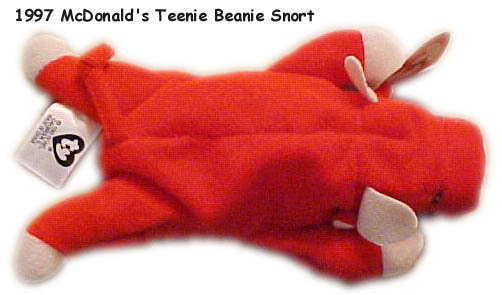 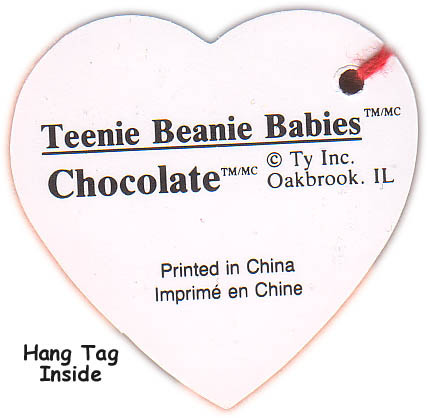 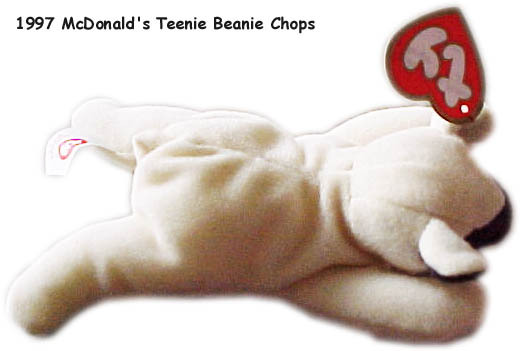 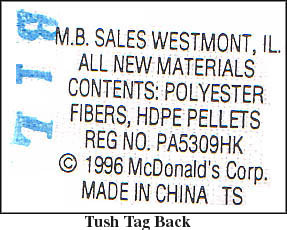 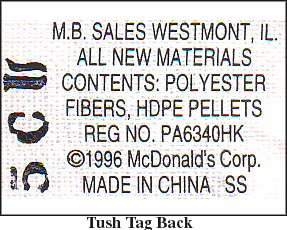 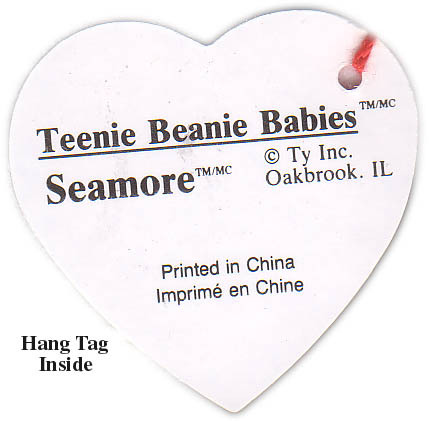 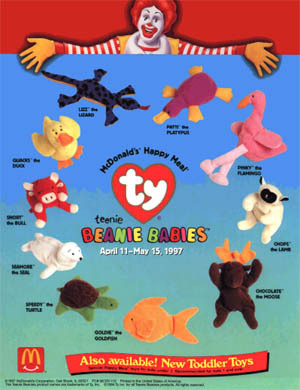 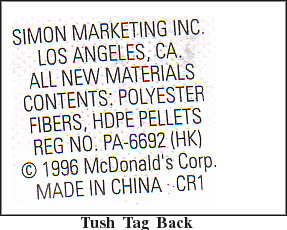 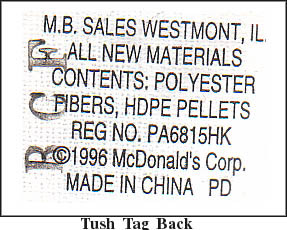 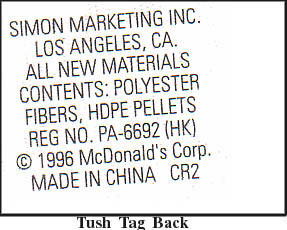 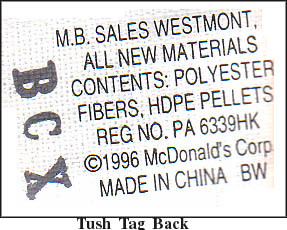 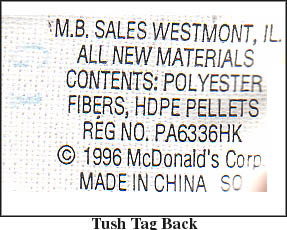 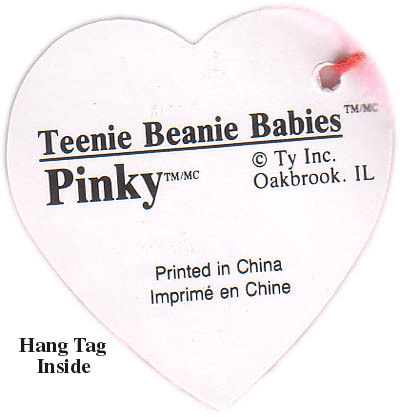 Teenie Beanies would be released each year at McDonalds until the year 2000. 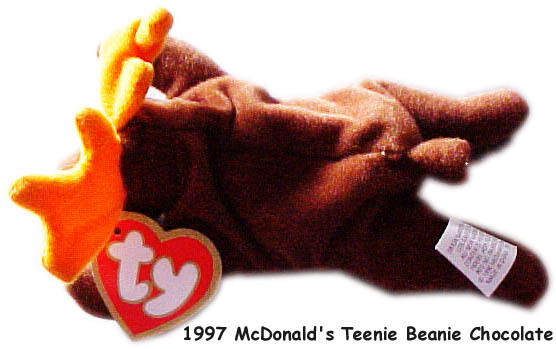 1 had heard that Ty signed a 5 year contract with McDonald's to do promotions, so if that is true that means something is in store for 2001, but what? 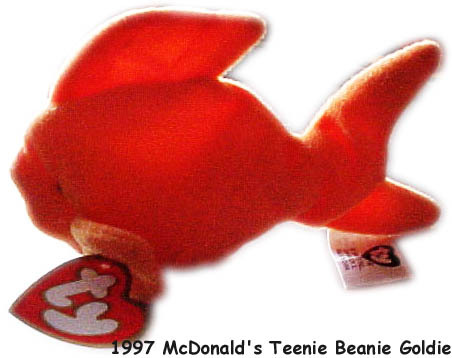 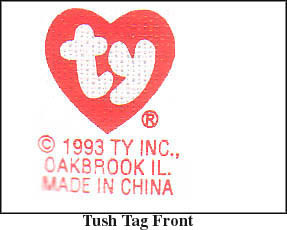 It has already been publicly announced that McDonald's would not do Teenie Beanies this year but that something else was in store for November 2001 with Ty! 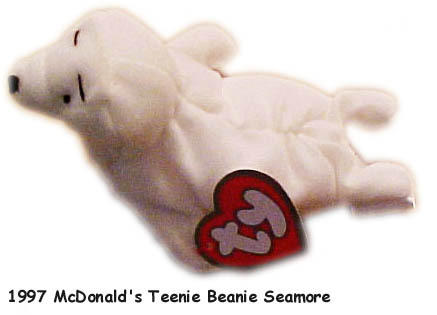 At the end of the promotion pins were distributed to employees of McDonald's that read "I Survived the Attack of the Teenie Beanie Babies!!" Inside was also the McDonald's logo.